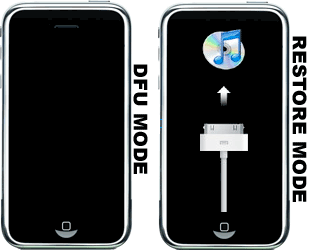 Before we start learning How to enter DFU mode in your iPhone lets learn what DFU mode is and when and why is it needed. DFU (Device Firmware Upgrade) bypasses the current OS installed on your iPhone. Allows you to upgrade or downgrade your iOS after you put your phone in DFU mode. This can be useful when you are getting errors trying to restore in iTunes, DFU mode is very likely for you. When to put your iPhone in DFU mode ? If you are trying to Restore your iPhone using Recovery Mode which doesn’t work you will have to use DFU Mode as a last resort. When you want to do a firmware restore using iTunes you should put your iPhone into DFU mode. The most common use for DFU mode is to jailbreak your iPhone. Step 1: Turn off your iPhone. Step 2: Hold down the power and home button. Step 3: Press and hold the Home button and the Sleep/Wake button at the same time. Step 4: After exactly 10 seconds release the Sleep/Wake button. Continue holding the home button until you see an pop up message in iTunes telling you that it has detected an iPhone in recovery mode. Connect your iPhone to your PC and launch iTunes. Hold the Power button while it is still connected. Hold the power button which will reboot your device and bring it back to normal.